I had hiked the hills on the south side of the Nick of the Balloch mountain pass two years back, so decide to hike the two hills on the north side of the Nick of the Balloch, the 1,639ft Pinbreck and 1,594ft Eldrick. I took the B7045 road from Ayr to Straiton village, as seen below, then continued south towards the Nick of the Balloch on the B7045 following signs for Glentrool and Newton Stewart, past the hill with the monument as seen below. About ten miles south of Straiton, you will see a sign for the village of Barr. About 1 mile up that hill road, you come to the Nick of the Balloch, as seen below. I had intended to drive down to the bottom of the Nick of the Balloch, about 1 third of a mile, and park at the Witches Bridge, where there is room for about 5 cars. After looking at the passing places up here, I realized I could park well in off the road, and still leave space for cars to pass, so decide to hike from here, where it is a few hundred feet less to hike, and not as steep. 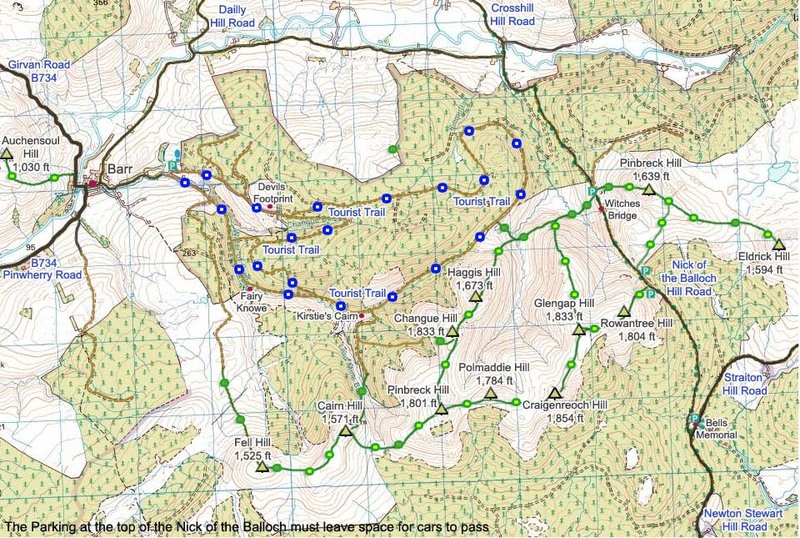 The image below shows the easy route from the top of the Nick of the Balloch, following a faint trail. Note I parked the car well in so to allow plenty of space for cars to pass. There are also a few grass verge places you could carefully park at. The image below shows the trail to the top of Pinbreck Hill. The trail leads up to that little mound, then you follow a fence to the top. This is a nice steady hike. Note the steeper Witches Bridge route over to the left. The image below is from the top of Pinbreck Hill looking southwest. Straight over that way takes you down the steep side to the Witches Bridge. The village of Barr is straight over the hill covered in trees. I had though about going straight down to the witches Bridge, then walk up the Nick of the Balloch to the car, but Eldrick hill is about 2 miles east, one of the few hills in Ayrshire I had not hiked. The image below is from Pinbreck Hill looking east to the 1,594ft Eldrick Hill, with the 2,520ft Shalloch-on-Minnoch in the distance behind. About 2 miles from here, so should be easy going, I thought. The image below is from the crossing over to Eldrick Hill. After about half of a mile, I had to cross a sheep fence. From then on it was over a mile through deep heather, with no trail of any kind. The image below shows the steep west side of Eldrick Hill. Was surprised at how quick I got to the top. After hiking through the deep heather to get to here, the hike up seemed a doddle. The Image below is from the top of Eldrick Hill looking back at Pinbreck Hill and the car park. You get great views of the Merrick Range from up here. I decide to take the route back shown by the lines, to a sub peek of Pinbreck Hill to get photos down over the Nick of the Balloch. The route was as tough as the direct route I took over to here, even snapped a hiking pole after stepping into a hidden ditch. The image below is from the sub peak of Pinbreck Hill, looking down to the Witches Bridge car park. This shows the rout up from the Witches Bridge car park is a fair bit steeper. The image below is from heading down from the sub peak to the car park, next to where the delivery truck is passing. That is Rowantree Hill on the other side of the road. There are a number of hills over there that are good hiking. The view below is of Cloncaird Castle that you pass between Straiton Village and Ayr, situated about 2 miles north of Straiton, with views like this from the roadside. The map below shows Pinbreck and Eldrick Hills, also the other hills on the south side of the Nick of the Balloch. This was a good steady hike to the top of Pinbreck Hill, with great views over the Nick of the Balloch. The hike out to Eldrick Hill was an adventure hiking through the deep stuff. Would only try that part of the hike if you are up for a challenge. I aim to hike every hill/mountain in Ayrshire and Galloway, not many left now.